Oakley Heads to the Northeast! I remember having one of the first conversations with Matty Swanson, Oakley’s sports marketing guru, when he said they were going to make a wakeboarding movie in 2007. He kept referring to it as the “Oakley Odyssey.” Somewhere along the line that title got into the hands of the cool machine and it changed to Push Process, but I always thought “odyssey” was a good concept for the film, particularly because of it’s aggressive schedule of worldwide film trips. Case in point: while we were in New Jersey and New York City filming this story, another crew of Oakley riders and filmers were in Brazil, gathering a different tale for the movie. “Odyssey” is a concept I have some experience with. For the past decade, I’ve spent a disproportionate amount of time on the road, in the air and on the water, shuffling on and off of couches throughout the world, covering the sports of wakeboarding and wakeskating. Every single one of those trips has had some sort of odyssey-like quality to it. Whether it was how we got there, the places we stayed, the fun we had or the struggles we overcame to get the job done, each one had a different means to an end. 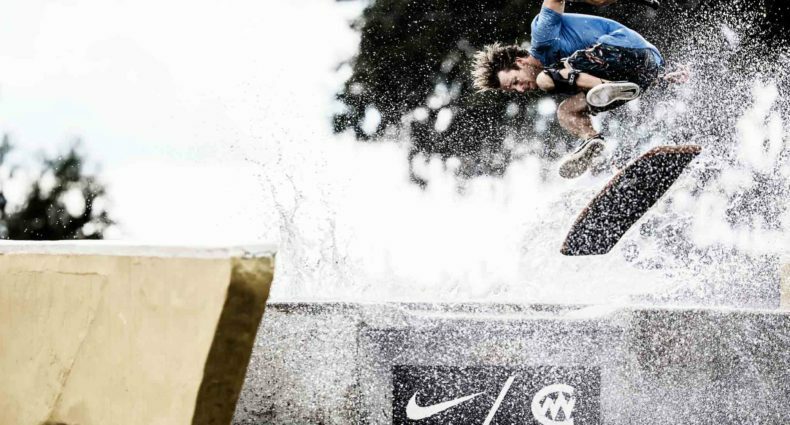 In fact, I’ve only found one common thread since the beginning: wakeboarders. Everywhere I’ve ever gone for the magazine has been filled with the amazing people who love this sport. Sometimes it’s been hard to see in the midst of a busy season when you’re longing to be home and stressing about the next deadline. And then you run into a guy like Maurice Matsumori, one of the most stoked people on the planet, and the author of the following account. Maurice is first and foremost one of the nicest guys I have ever met. Secondly, he considers himself a wakeboarder at heart, and has been for longer than many of us have been involved in the activity. Maurice has a fancy, high-paced job on Wall Street, providing corporate psychology and team building strategy for Met Life. He also has a wife and two kids. But when it came time to take his vacation, he didn’t think twice about taking a week off and shepherding us around the Northeast to get film for Oakley’s movie and a story for Alliance. In fact he was happy to do it, just to be a part of the larger experience. Without him the trip wouldn’t have happened. Of course he did have some help – Bob, Diane and Andrew Baxter opened their home to us, and Mike Ballone and Mike Heffron went above and beyond the call of duty. The beginning of any wakeboarding season is a great time for me. I get really excited at the prospect of riding again after the cold New York winters, and even more so at the prospect of riding some new equipment. So this year I called Mike Zimmerman at Liquid Force to get a product catalog so I could pick out my new ride. New York City doesn’t exactly have the ideal wakeboard shops, so when Mike said he was sending one out right away, and also throwing in a copy of The Truth for me to review, I couldn’t wait to get both. After watching the movie, I called him back and asked him to tell the director that it really touched a chord in me, giving me some serious adrenaline, which in turn broke up the monotony of my typical daily grind on Wall Street. Instead of passing on the message, Mike said, “Why don’t you just call him yourself?” He gave me Justin Stephens’ information, and not long after I was on the phone, speaking to Justin about the impact his video had on myself, as well as my riding friends. My friends are from different socioeconomic and cultural backgrounds, but we all find a common interest in wakeboarding. During the conversation, Justin mentioned that he loved New York City, so I asked him why he had never filmed here. When he told me it was because he didn’t have a contact, I jumped on the opportunity and volunteered myself to help out in any way possible to make it happen. A few months later, some of the most noted names in the business were on my doorstep, filming for Oakley’s Push Process. The following is a summary of that incredible week for me. After church, my friend Mike Heffron and I went to pick up the Push Process crew at the Newark airport. Justin made it in earlier than the rest, so we picked up a minivan before the others came. We then returned to pick up the rest of the crew consisting of Keith Lyman, George Daniels, Chase Heavener, Amber Wing, Matty Swanson and Tony Smith, and headed off to Rumson, New Jersey. Why a small coastal town in Jersey? Because that is where Bob and Diane Baxter live, as well as their son, Andrew. Additionally, Mike Ballone of Line’s End Wakeboarding School had agreed to host some of the crew. Most of us stayed at the Baxter’s home (which happens to be right next door to Bruce Springsteen’s house), while some opted to stay with Mike and his girlfriend, April, just down the road. The Baxter’s house is pretty radical, and Andrew told us about the time he almost got beat up when he snuck into his backyard and ran into some hefty bodyguards. After some visiting, everyone crashed. It was going to be a long week ahead. The first real day of the trip was one crazy day. We were introduced to the “stoke meter” by Chase and Tony, which is their measure of how excited a person is. Let’s just say my stoke meter was running way beyond capacity for the events of the day. 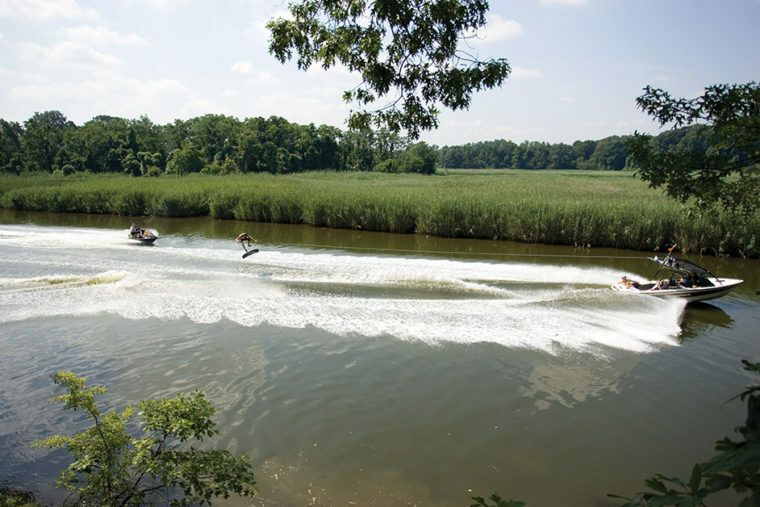 We rode the Navesink River in Red Bank, New Jersey – the conditions were perfect and the riders were incredible. 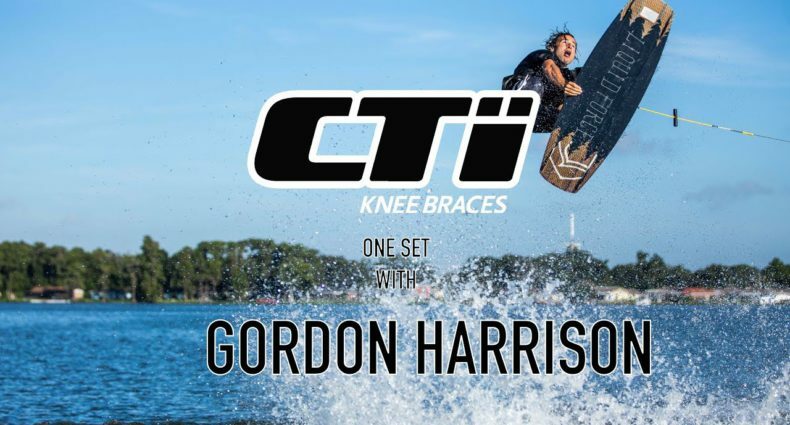 George Daniels put on a wakeskating demonstration that was truly inspiring, which included landing a switch wake-to-wake frontside big spin right in front of Chase’s camera. Log that one for the movie. I also found out that George is one of the funniest people you will ever meet. Later, Amber Wing rode and showed us why she is the world champion, and then Keith Lyman ollied some buoys right behind Jon Bon Jovi’s mansion on the river. They make it all look so simple! Later on, Chase put on a show by diving a huge Waverunner under the water. He’s a big, strong guy, so I guess he had what it took. After the riding, we went back to the Baxter’s house for some grub. I don’t know how Lyman stays so fit, he eats like a horse! Also, a warning to you if you are ever around Chase Heavener. When Chase has a prolonged smile, either run, or brace yourself, because a strong stench is about to follow! Riding continued in Bordentown, New Jersey on the Delaware River. I think the guys were pretty impressed that this is where George Washington made history, but Amber was too busy trying to make a little of her own. She nearly landed a heelside 720 off a double up, which, if it had been successful, would have made her the only woman in the world to have done so. Actually, she came so close a few times I don’t know how the handle popped out! Meanwhile Keith, riding at 90 feet out and at 27-28 miles per hour, launched a stalefish so high that it looked like slow motion. During a break in the filming, Chase rode and launched tantrums to blind while cutting out only a few feet from the wake. An incredible display of proper form and function. We also had a treat as we saw Justin Stephens ride for the first time in years. He blew his knee out five years back and hasn’t ridden since. His reason was completely selfless as he mentioned that he didn’t ride because his first concern was not getting injured so that he would not be a burden to his wife. He is a great example of putting family first above self. You could tell he missed his family. It’s no wonder he is so highly regarded among his peers. I’m feeling pretty spoiled being a part of all this. We were back at Bordentown. Keith Lyman put on another exhibition, and showed his techy side both in riding and in being a boat expert. Keith has to ride with a particular propeller when behind a particular MasterCraft, but he didn’t have it for the day before. It was dropped off in the morning, and man, was it worth the wait. The wake was huge. He was jumping wake-to-flats over an eight-foot buoy with ease. Although the riding was incredible, I’d say the highlight was witnessing the riders interact with some random fans that had come down to the docks. I asked Keith to go say hello to a boat of spectators, most of whom were kids. He didn’t hesitate to do so, and when the little kids saw who was in the boat, they were pretty much speechless. The riders spoke to them like they were friends. It showed me why I love wakeboarding, with star riders so willing to interact with the community – pure magic! I also rolled my ankle pretty hard on a curb later in the day, but it’s pretty cool to have world-class riders help you back up. When we finally got home, Keith and Chase had a jumping contest. Keith can make a standing jump onto the platform of a boat on the trailer (at least four feet). Chase said he could do it, and of course none of us thought he could, since Keith spends all day jumping and Chase spends most of his days at an editing bay. But he took one step back, jumped and made it. I could have sworn I heard some flatulation when he did it – his equivalent of a rocket booster! We left New Jersey behind and headed for Manhattan, New York. I was in the car with Matty Swanson and Justin Stephens while Keith Lyman and Mike Heffron hauled the boat. While driving, one of the boat seats flew out of the MasterCraft onto the freeway, and of course was run over. It still worked though, as the pieces fit together despite being crushed. After dropping the boat off at Mike Heffron’s friend’s construction site in Fort Lee (parking in Manhattan is impossible for a car, let alone a huge boat), we met the rest of the crew at my buddy Cannon Anderson’s apartment complex where he put them up for the remainder of the trip. 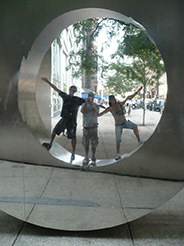 While walking around Manhattan, Amber found out that it was Keith’s 24th birthday. He hadn’t said anything, but the crew took him out for dinner at the Hawaiian Tropic Zone in Times Square. The crew talked about the possibility of poaching some winch spots in the city, but N.Y. is still pretty suspicious of anything that looks strange, so we decided it might not be the best idea. 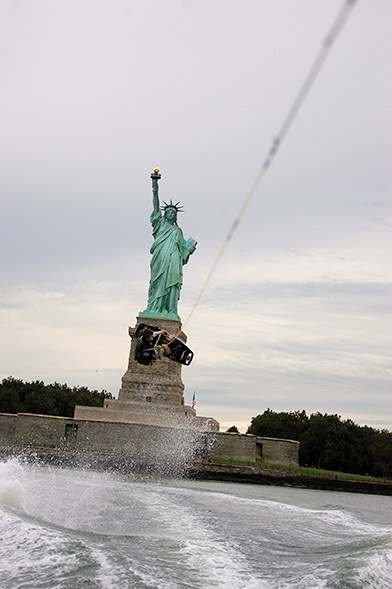 Besides, Justin was really just interested in getting one shot – riding in front of the Statue of Liberty. That would have to wait though, since he also wanted to get some scenes from the Big Apple for the film. Today was a tourist day for the Oakley riders. First it was off to downtown, including Ground Zero. I was 150 yards away from Ground Zero when the towers collapsed six years ago. It was nice to be able to share the story of that day with the riders, and also show them some of the photos I had taken after the collapse. 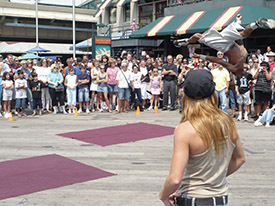 Later we stopped by the South Street Seaport where we watched some contortionists and acrobats, and Amber was chosen to be a volunteer in their show. She was a champion gymnast in Australia, so after some goading by the rest of the Oakley team, she did a round off, back handspring, back flip to the surprise of the crowd and performers. Of course they weren’t having it, and one of them did a five-foot high layout back flip right in front of her. 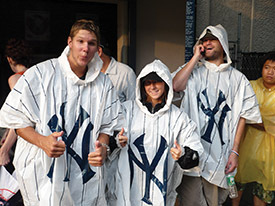 Later on, the crew headed off to the Yankees game. Matty had hooked everyone up with some pretty sweet tickets through his Oakley connection. While they were at the game, my buddy Dave Thatcher and I picked up the boat and drove it across the Hudson River, docking it in Manhattan. There was a raging storm the whole time and the Hudson can get wild! What a dagum blast! 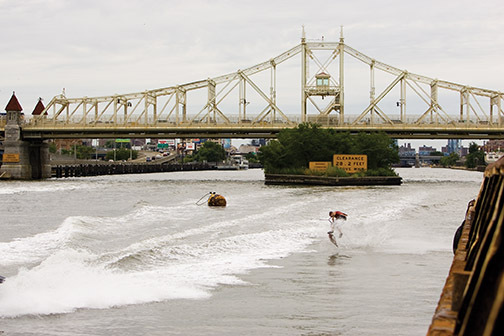 When we arrived at the 79th Street Boat Basin, we were drenched but with great big smiles. This day began at 3:30 a.m. We needed to get on the Hudson before the water got rough, and that meant before the sun came up and the cargo ships started to come in. Dave and I picked up the Oakley riders and drove them to the 79th Street Boat Basin, but despite getting up so early, the wind put a damper on the riding. We drove upstream to the East River and found a patch of smooth water, but that lasted a few minutes. Despite the wind, Keith and Amber were doing their best until Justin made the decision to call off riding. We stopped by Tom’s Restaurant, which is the place they used for exterior shots in the beginning of Seinfield. While there, some old man began singing “I want you to be my baby” to Amber. Only in New York. The rest of the day was spent resting and sight seeing, including mid-town Manhattan and dinner at Chevy’s on 42nd Street near 8th Avenue, which is the place Justin heard he had won his first Wakeboard Film of the Year award while vacationing with his wife a few years back. I was teaching a lesson at church, so I gave my seat on the boat to my friend Lilian Hough. As important as wakeboarding is to me, there are still other things more important. Needless to say, Lilian is now newly motivated to ride. How could one not after seeing such incredible moves, especially the several tricks that finally got landed in front of the Statue of Liberty. Justin’s dream was complete. After church, I met the riders at the apartment where everyone was packing up and getting ready to go. I consider these people friends now. They certainly know how to have a great time, but also balance it with hard work, and I think that’s going to show in Push Process. The last to leave were Tony Smith and George Daniels, whom I had dinner with. Tony is a great guy, more of a voice of reason in the bunch. 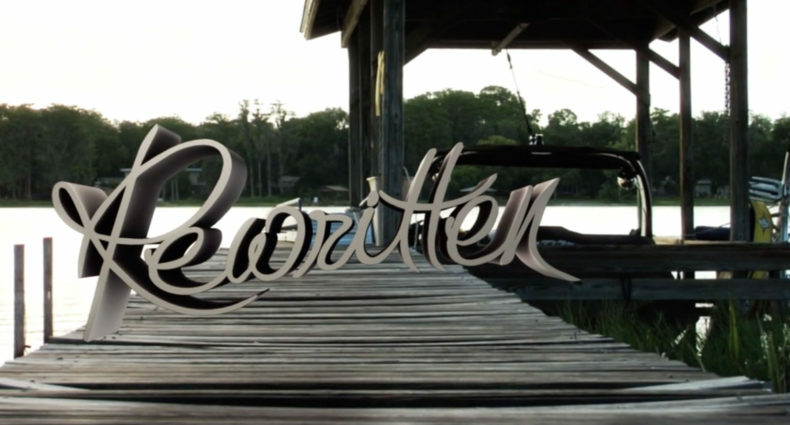 He shared a story that personifies the true essence of wakeboarding “oneness.” It was the story of Keith Lyman getting Ben Greenwood to move down to Florida. Keith sacrificed his room to Ben and bought a tent and slept outside for a year before both he and Ben made it big in the industry. While seeing all these superstars of the sport was great, it was stories like these that made me realize that a good number really are valid heroes, worthy of emulation. Over the years, a lot of people have written in or asked for advice about the camera equipment used to shoot wakeboarding. While there’s no substitute for a digital SLR with a sequencing drive (a must for anyone serious about catching wakeboarding’s high speed moves) I’ve always suggested getting a good point and shoot as a start. Many of them have manual controls that are similar to an SLR, and if you can learn how to anticipate the slower shutter sync command in time with the action, you can take some pretty decent riding photos. The other obvious reason is that they are way easier to carry around and catch the things that go on during time spent on the water, which can be just as good a representation of the day as a decent riding photo. So in keeping with this issue’s photo annual theme, here’s a gallery of images I took with my $179 point and shoot camera – the Panasonic Lumix FX-12. It’s got a Leica lens and almost the same exact components as its $250-more-expensive Leica counterpart, and shoots amazing photos. None of the ones you see below have been altered for color, they are all as shot from the camera. Actually, I bought this camera on this trip to N.Y.C., at B&H Photo. B&H has earned a reputation as one of the most prolific camera equipment distributors in the country, and is also one of the craziest stores I’ve ever been to in my life. It’s owned and staffed by a community of Hassidic Jews, you know, the people who wear the black hats and have the long, curly sideburns. They also happen to be the most knowledgeable camera salesmen I’ve ever met. If you are ever in N.Y.C., you owe it to yourself to go there. Just make sure to bring your wallet, because you’re going to want to buy something.